A new cavity-fighting liquid… Silver Diamine Fluoride (SDF) is a liquid that can be used to halt the progression of cavities. This is especially helpful for young children who are not mature enough to handle routine restorative care. This liquid takes less than 1 minute to apply with no noise, no drilling, and at the same time, it kills the bacteria that cause decay. 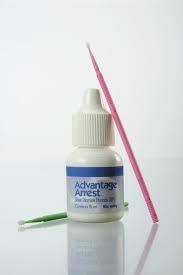 SDF is a non-invasive liquid medication that is proven to be very effective in arresting, or stopping, tooth decay. Unlike other treatment methods used to treat tooth decay such as fillings, silver diamine fluoride is applied to the teeth with a brush. Silver diamine fluoride has been approved by the FDA for tooth sensitivity, but it is also very useful “off-label” for the treatment of tooth decay. The active ingredient in silver diamine fluoride is silver, a compound used in medicine for over a century because of its potent antimicrobial properties. Interestingly, it is very effective in killing the bacteria known to cause tooth decay. Silver diamine fluoride has been integrated into our practice for a variety of reasons. It can be a great option for very anxious children and it can be used on baby teeth that are nearing exfoliation, which spares unnecessary fillings or other extensive dental treatment on teeth that are on their way out. 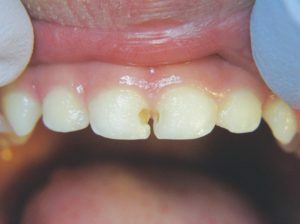 The significant side effect of silver diamine fluoride is discoloration. Healthy tooth surfaces remain undisturbed, but tooth decay (which is usually brown in color) turns very dark, nearly black, after application. This discoloration is what we look for during follow-up appointments to know that the applicaiton was effective. 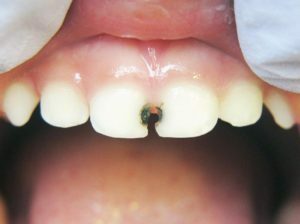 Using silver diamine fluoride to treat tooth decay in very young children results in dark discoloration of the decayed area. While many parents are just happy to have an alternative to more invasive options, some parents are left with cosmetic concerns, especially as their children enter their school-aged years. Using silver diamine fluoride does not eliminate the need for dental fillings or crowns to restore function or esthetics. In many instances, we are able to use silver diamine fluoride while children are very young or anxious, and as they mature we can later restore their teeth with more conventional treatment. We feel this is a very good compromise between health and esthetics. There are many factors to consider when deciding which treatment modality is most appropriate for your child. Silver diamine fluoride is a very effective method for managing tooth decay in young or anxious children, and for teeth that are close to falling out on their own. It is non-invasive and very economical. If you would like more information regarding the use of silver diamine fluoride for your child, please contact our office at (219) 286-6148.